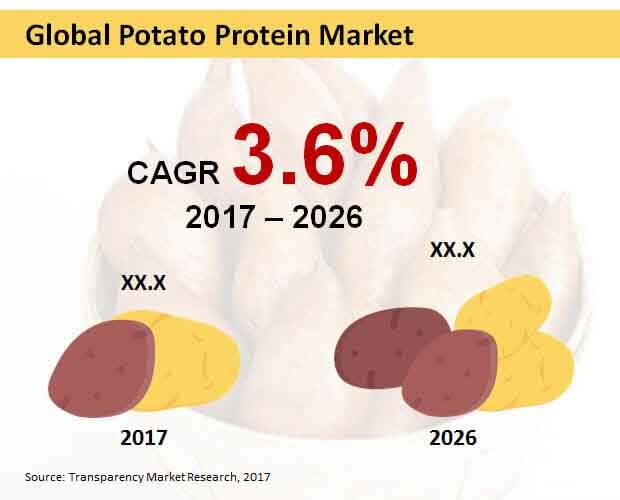 The global market for potato protein is displaying a highly competitive business structure, finds a new research study by Transparency Market Research (TMR). Roquette, Solanic BV (AVEBE Group), Agrana, E. I. du Pont de Nemours and Co., Omega Protein Corp., Kerry Group Plc, Cargill, Archer Daniels Midland Co., KMC Ingredients, AKV Langholt, Südstärke, Peppes Group, Meelunie, and Emsland Group are some of the key players in this market, making its competitive landscape extremely fragmented. The leading companies are focusing on expanding their regional bases to strengthen their position. In the years to come, vendors in this market are likely to take up strategic partnerships, states the research report. According to the research report, the global potato protein market is expected to expand at a CAGR of 3.60% during the period from 2017 to 2026, the market is projected to reach US$152 bn by the end of the forecast period. Isolated and concentrated potato protein are the main products available in the global market. Among these, the demand for concentrated potato protein is comparatively high, thanks to the high consumption of dietary protein concentrates, and the trend is projected to remain so over the next few years, reports the research study. On the basis of the geography, the global market for potato protein has been classified into North America, Latin America, Asia Pacific excluding Japan, Japan, Europe, and the Middle East and Africa in this research report. Among these, the market in Europe has acquired the dominance, thanks to the high consumption potato protein. This regional market is expected to remain on the top over the next few years. The presence of a large pool of market players is likely to support this regional market in the years to come. The Middle East and Africa, North America, and Asia Pacific are also expected to witness a significant rise in their respective markets in the years to come, states the research report. “The global market for potato protein is benefiting substantially from the rising preference for protein-rich food,” says an analyst at TMR. Going forward, the market is likely to be driven by the notable progress in food technology and innovation over the next few years. However, the high cost associated with the processing of potato protein may hamper the growth of this market in the near future, states the research report.